DC’s Villain’s month is here and the Talking Comics crew previews the entire thing. Want to know whose writing The Joker one shot and what we think of it? You’ve come to the right place! Bob, Bobby and Steve go over every single title and creative team to give you the best information on how to spend your hard earned dollars! In addition they list their top 5 DC Villains of All-Time and you will be surprised by some of the choices. The gang also talks Trinity War, X-Factor, Aquaman, Locke and Key, Batman Superman, Uncanny X-Men and Hoods! The Comic Book Podcast is brought to you by Talking Comics (www.talkingcomicbooks.com), a blog dedicated to covering the latest and greatest in comic book releases. The editorial staff is composed of Editor-in-Chief Bobby Shortle (Fanboy Remix, Doctor Whocast), Stephanie Cooke (Misfortune Cookie) and Steve Seigh (JoBlo.com contributor) who weekly dissect the releases and give you, the consumer, a simple Roman yay or nay regarding them. Our Twitter handle is @TalkingComics and you can email us at podcast@talkingcomicbooks.com. Thanks so much for the mention, Bob! Steve and Bobby, I had sent you guys copies to your TCB emails a while back. If you ever get the chance to scope it out, let us know what you think. Great show today, as per usual, gentlemen. It was my honor to have read something that uses the comics medium to make a statement about such an important set of issues, and in such an uplifting way! Hoods was my “Book of the Week” by a hair over Kelly Sue DeConnick’s Captain Marvel, which is my favorite book on the stands, so that speaks volumes about how much I enjoyed the effort by you, Jarelle and Jaclyn! No pressure, but don’t let me down with issue #2–keep those standards high! Wow. Haven’t heard someone talk about The Pretender in YEARS. I think I just had an actual flashback to my family and I watching that show religiously. Anyway, I swear thats not all I got out of this weeks podcast. Thanks again! Well I managed to recently revisit the entire series of Sliders so maybe this is the next step in 90’s/2000’s TV nostalgia. 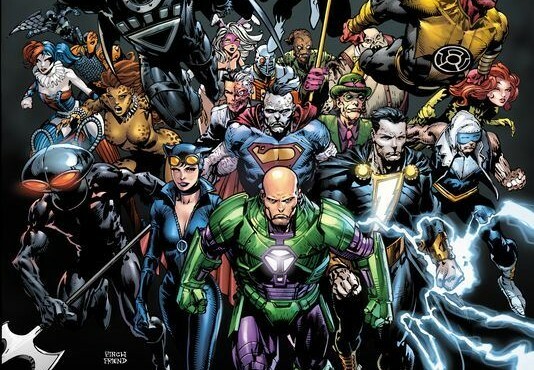 I’m really glad you guys decided to do this podcast because I didn’t read Trinity War but I wanted to jump into Forever Evil just to be in the know on what’s going on in the DCU. I also know it’s easy to dismiss the Villain’s Month thing as just a ploy for more money, so it was great to hear you guys excited about a number of the titles. That being said, I’m a little disappointed in the way DC is titling these books, primarily something like Cyborg Superman. I know you guys scoffed at the character but he’s actually being used quite effectively in Supergirl right now, and the last issue ended with a major revelation as to who this Cyborg Superman is. I know that Cyborg Superman is really Supergirl #23.1 but I can’t bring myself to buy it because DC thinks it should be called Action Comics and feature Superman on the cover even though he has nothing to do with the current character. It’s also insanely frustrating that none of the creative teams are featured on the covers to any of the books. Without something like your show to guide comic buyers, it’s really just depending on whose cover looks the best. Rant over. The creative teams not be featured is a bad oversight. A friend of mine surmised that it might be them trying to fool people into believing the regular creators are writing these titles. Which is disingenuous at best, and short sited on the other. When someone like you, who actually likes a book and its creative team, has to search out the fact that they are actually writing something this month its ridiculous. John, I scoff with nothing but love! And honestly, what the hell do I know about Cyborg Superman, right? Ha ha! If it’s awesome you be sure to let me know, okay? Thanks for that episode guys it was super helpful and informative. I really enjoyed being able to sit down and get a good rundown and some opinions on all the Villain issues coming out. I wasn’t interested in this leading up to this month but I loved issue one of forever evil and will be giving some of these a go. Thanks again. Enjoy Villains month.